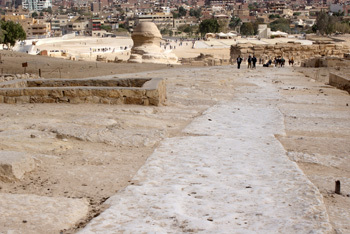 The Surroundings of the Sphinx, Going back in time. As I was standing on the Giza plateau behind the Sphinx, on a cool morning of the day after the great annual feast of Aïd, it suddenly dawned on me that this was the perfect day of days for studying the overall configuration of the site, because it’s the one time in the year when there is hardly anybody about, or at least there is no daunting tide of tourists. What ensued is something I must tell you about because in times to come it will be seen as a real turning point. In fact there is a good chance that everything you know about the lie of the land between the Sphinx, the causeway leading to the Khafre pyramid and its surroundings will have to be completely revised. A great many new factors are coming to light and one day a lively battle among the experts might lead to a conclusion that would upset the ‘politically correct’ assumptions imposed until now. Between the Sphinx and Gigal the erosion patterns of the enclosure. Even if you have no strong opinion one way or the other, it’s widely acknowledged that there are a mass of queries about the dating of this part of the plateau, in particular of the Sphinx and its surroundings, because until now little attention has been paid to the damage it has suffered from weathering. This issue more than any other has started an unending battle among the experts, and even the ‘officials’ no longer agree with each other. Thus for Mr Hawass the fact that in certain places around the base of the Sphinx there are non-eroded blocks of stone behind undamaged facing stones proves that the Sphinx was covered with an outer facing from the beginning, while his friend the archaeologist Mark Lehner insists that the facing could only have been added during restoration in the New Kingdom. You’ll say that in itself that doesn’t make much difference, but not at all, that’s just the beginning of a mounting wave. More and more researchers, and not the least of them, are beginning to rush into the breach opened by the simple word ‘restoration’. Though even the official experts can no longer deny that many of the remaining monuments in the country were restored in the distant past, which makes them even harder to date, now it’s a matter of convincing them that restoration work could have been carried out in the so-called pre-dynastic era. 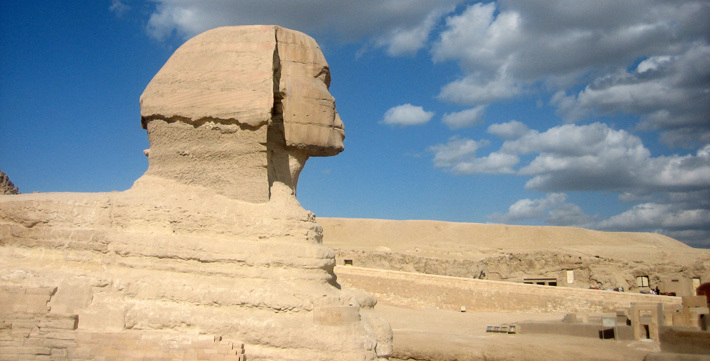 First of all came the earth-shaking shock triggered in the 1990s by a geology professor at Boston University, Robert M. Schoch, and the independent Egyptologist John Anthony West, who stated that the Sphinx showed evidence of erosion by very heavy rainfall. This implied that it could only have been carved during or just before the heavy rains that marked the transition between the last Ice Age and our intermediate era in North Africa, a transition placed between 10,000 and 5000 BCE. This would totally invalidate the official theories that date the Sphinx to the Fourth Dynasty at the time of Pharaoh Khafre (2520-2494 BCE). You can imagine the storm of indignation aroused by these claims in the conservative and touchy university hierarchies. However since then many new discoveries have tended to confirm this very much earlier date for the structures built on the plateau. The remarkable work of the Eng lish geologist Dr Colin Reader, presented in his reports from 1998/1999/2001/2006 (see Bibliography), updated again this year 2010, and that of many other geologists and researchers, has brought to light several factors that significantly reinforce the so-called ‘alternative’ thinking on the subject. This thinking is steadily gaining ground, the more so because it is supported by some big names. Welcome or not, a wide-ranging questioning is under way, with each new clue, each piece of evidence stirring up yet more questions. After all, if doubts are aroused about one feature of it, the whole site has to be reconsidered. Thus if it is proved that the Sphinx is much older than the Cheops pyramid, then because of structural and architectural factors the mainstream Egyptologists are forced to reconsider the dating of the processional way of Khafre and the Sphinx Temple. The theories of Dr J. 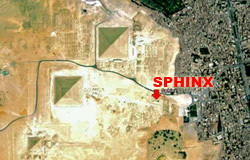 A. Harrel and Dr K. L. Gaury have been put forward to counter the theory of the Sphinx being much older because of the erosion from heavy rainfall. 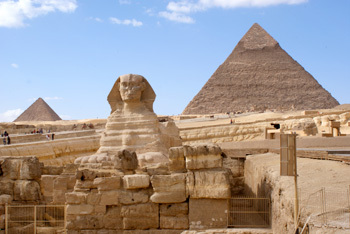 Dr Harrel’s theory of the erosion being caused by the Sphinx being buried for long years in damp sand has been invalidated in a masterly way by Colin Reader, along with Dr Gaury’s theory of chemical erosion caused by the rising water table, an explanation that is only partially valid. Even on the matter of the Carbon-14 dating of the three pyramids and other monuments on the Giza plateau, which was carried out by several institutions, the experts are not in agreement. Between the tests carried out on the same buildings by A.R.E. in 1984 and by the Kosh Foundation in 1994 and 1995, using the same dating procedures, there is a difference of 400 years. This difference arises from several factors that, when one looks at them closely, raise question marks about all the standard dates. When trying to date pieces of wood (E. Libby in 1949 on acacia in the pyramid of Djoser) or furnace ash found at Giza (1995) there is a risk that in fact the material analysed may be the remains of wood from restoration or deposition at a later date in the past, thus giving false results for something that is in fact much older. The same is true for dating tests on samples of mortar from the pyramids, which might be from the many restorations carried out over time by various dynasties. 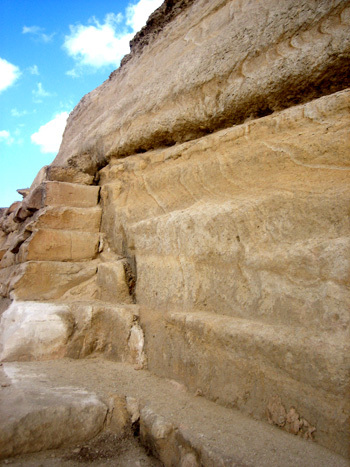 We should remember that the mortar used in the pyramids to level and secure the stone blocks is made from gypsum heated with lime over a wood fire then mixed with quartz sand and calcite, which hardens when it is exposed to air. You can imagine how hard it is to obtain an accurate date from scientific analysis of the ingredients! The answer depends on which one you decide to analyse. And there are plenty of other causes for doubt that arise: for instance quite recently it was noticed that on most of the vases found beneath the pyramid of Djoser (Third Dynasty) his name appeared only once, the other inscriptions being of kings of the First and Second Dynasties. So did Djoser simply reuse vases that were hundreds of years older? But let’s get back to where we started on the plateau. Since one cannot totally trust the results of the official tests using Carbon-14, what are we to think when we realize that neither the lower Valley Temple of Khafre (on the southern side of the Sphinx) nor the upper one (at the foot of the east side of the Khafre pyramid) has ever really been dated convincingly! Both of them include a core of megaliths that seem to be very much older, as the geologists Schoch and Reader have confirmed. Others have commented that the base of the Khafre pyramid seems to be much older than the main structure. According to Schoch, the fact that a statue of Khafre was found in the lower temple shows that he made use of it and explains why the granite facing blocks date from his era. It is quite possible that he only restored the temple and bought it back into use, since the granite facing covers enormous blocks of limestone that are very much more ancient. 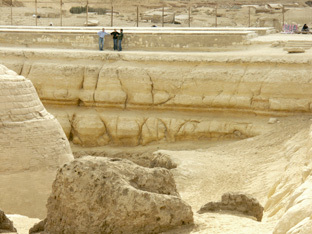 In the opinion of the geologists the walls of the Sphinx enclosure show that excavations were carried out there in the past, before the opening of the old quarries in the west. 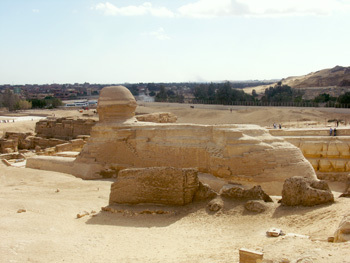 As for the processional way leading from the Sphinx to the foot of the Khafre pyramid, here too the experts cannot agree among themselves whether the way was built before the Sphinx and therefore dictated the oblique angle of the southern wall of the Sphinx enclosure. Even Dr Rainer Stadelman, a member of the new ‘non-believer’ faction, admits that the Sphinx could have predated the causeway. Colin Reader has concluded that it also links with a very much older part of the Upper Temple. Taken together, Robert Schoch’s analysis of subsurface weathering (which highlights the difficulty of reconciling dates based on geological factors with the dates of conventional Egyptology) and the very detailed work of Colin Reader lead to a radical reconsideration of the great works carried out at Giza by the ancient Egyptians. And this leads us to an even more interesting point. Some time ago John Anthony West suggested that many of the monuments in Egypt could have originated in the prehistoric period, that’s to say that they could have been built on foundations established in the pre-dynastic era. After all, in the Neolithic period in England people were capable of handling and erecting megaliths! The structure on the plateau that some people call the tomb of Khentkhawes is according to others a pyramid. A new pyramid in an area where we thought everything had already been found? We’ll have to get used to the idea sooner or later. In 1932 the great Egyptian archaeologist Dr Selim Hassan found this pyramid on the route of the processional way from the pyramid of Mykerinos. 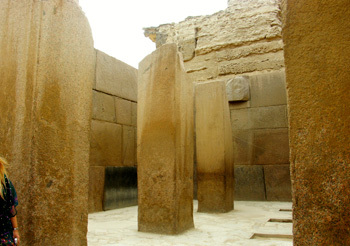 Since in part of its southern side a door of pink granite was found carrying the titles of Queen Khentkhawes (‘she who stands before her ka’), who was identified as a queen of the Fourth Dynasty and daughter of Mykerinos, it was decided without any further proof that this was her tomb. But make no mistake about it, this pyramid consists of an enormous core of blocks of Tura limestone with other stonework added on top. It could perfectly well be the remains of a very ancient pyramid that was adapted at a later date as a mastaba-tomb by adding the features that can still be traced. A report from some French researchers provides good support for this hypothesis. The work of Suzanne Raynaud, Henri de la Boisse, Farid Mahmoud Makrum and Joel Bertho, presented in their recent geomorphological study “Geological and Geomorphological study of the original hill at the base of a Fourth Dynasty Egyptian Monument”, goes a long way towards proving statistically that every structure built on foundations lying on an outcrop of bedrock such as a mound was originally an actual pyramid. By contrast, tombs were either dug into the ground, as at Dashur and Saqqara, or mastabas built in masonry above ground as at Illahun, Meidum, or dug into the side of a mountain as in the Valley of the Kings. According to this study, the identification depends on the percentage of bedrock underneath the pyramid structure. The proportion of 64% in the Khentkhawes foundation proves that it is indeed a pyramid, like those of Cheops, Khafre, Abu Rawash, etc. Even if these remarkable researchers still conclude that it is a construction method used in the Fourth Dynasty, it is a very interesting and significant step forward. 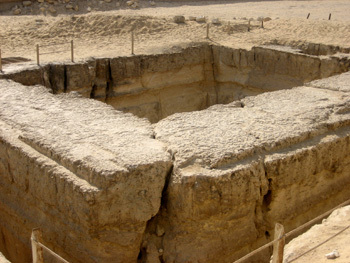 Like all true pyramids, the Khentkhawes structure has its valley temple and even its boat pit. Thus it is a genuine pyramid close to the Sphinx, and as such compels us to think again about the layout of the whole plateau. A number of specialists are beginning to take on board the fact that no true pyramid was ever built originally as a tomb, even though in the course of time the remains of its structure might have been reused as a tomb or for other purposes. This is the theory of ‘juxtaposition’ that many reliable specialists such as Mortensen and Kromer are beginning to adopt. Thus the officially declared fact that nothing in this part of the plateau predates the Fourth Dynasty is beginning to totter precariously. 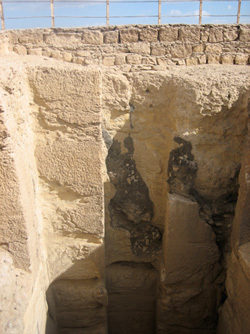 Colin Reader has highlighted the fact that the side of the Khentkhawes pyramid that includes the granite door has clearly been covered with limestone facing typical of the Fourth Dynasty, but that behind it one can see a façade of niches, a decorative feature called ‘in palace style’, a recognised hallmark of much earlier dynasties that is very different from the austere style favoured in the Fourth Dynasty. 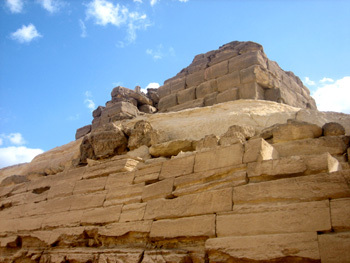 This discovery has been confirmed by the work of B. Mortensen and K. Kromer, who found these features not only on the Khentkhawes pyramid but also on the nearby Kai mastaba. 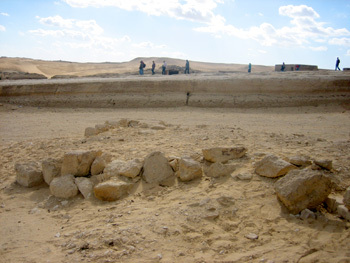 Khentekhawes pyramid. You can see on the top the built mastaba and under the big rock outcrop that was covered before by layers of stones alike you see on the basis. Abu Rawash pyramid and other pyramids are built also on a huge rock outcrop. Photo: Gigal. 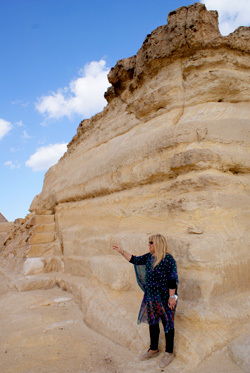 Reader discovered that the signs of erosion visible in the oldest part of the Khentkhawes structure looked much like those seen on the west wall of the Sphinx enclosure, another clue pointing to a date older than the Fourth Dynasty. And further south, in confirmation of the work of the renowned English archaeologist Flinders Petrie, he found that the Mastaba T is indeed from the First Dynasty and that the Covington tomb was from the Third Dynasty. Further north, Mortensen recently concluded that four ceramic jars found in perfect condition at the foot of the Great Pyramid in 1800 belong to the pre-dynastic period called the Maadi culture (“Four Jars from the Maadi Culture found at Giza”, MDAIK 41). During excavations on the northern side of the plateau for a civil engineering project to supply running water to Greater Cairo, Sanussi and Jones also found some pottery from the Maadi period (“A Site of Maadi Culture near the Giza Pyramids”, MDAIK 53, 1997, pp. 241-53). Colin Reader’s thorough work has provided plenty of evidence of the building method he calls ‘nesting’, where later monuments are often ‘nested’ on the foundations of earlier buildings dating from the earliest dynasties and even before, as we have seen. The remains of the lower Valley Temple, where you can clearly see on the uncovered upper part much older limestone that has been definitely dated by the geologists. Among the other structures in the area that raise many questions is the famous Campbell Tomb. In the last few months it has been excavated afresh. The photos show how far the work has progressed, though no mention of it has been made anywhere. No information has been given about the work being done and no observer is allowed on the site without a permit. Is this for fear that something might be revealed to the public that proves an earlier dating? That wouldn’t be surprising given the fact that no samples have been sent to a lab for dating (at least not officially) during the excavation process. 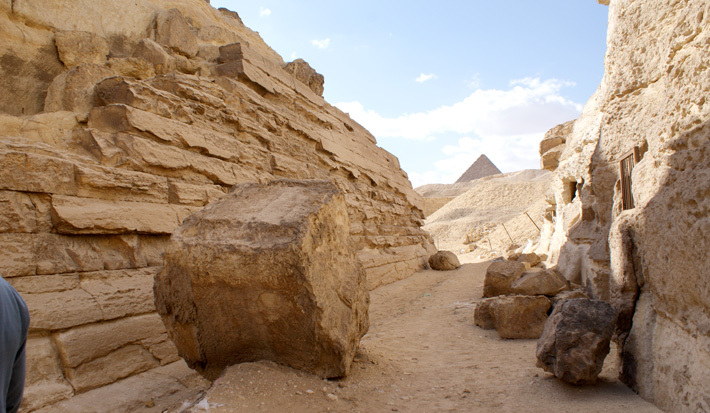 In any case there is a mystery about the story of this ‘tomb’ (named after Colonel Patrick Campbell, the British Consul who supported the work of Howard Vyse and Giovanni Caviglia at Giza), dug out of the quarry 30m behind the Sphinx and north of the Khafre causeway. It is a matter of record that in 1830 Colonel Vyse found this very wide shaft (it is thought that at least 10,000 tonnes of limestone had been dug out of it! ), almost square (9m x 8m), surrounded on all sides by a deep trench. On 11 February 1837, when the sand had been cleared out of it to a depth of more than 30m, he reached what he thought was the bottom, where there was a small stone structure that turned out to be a tomb. Nobody agreed about the date of the shaft. 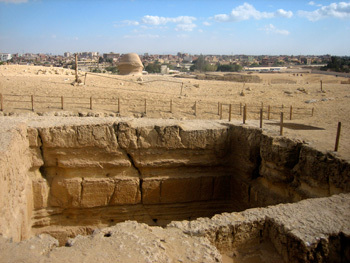 There were two conflicting official theories: the 19th century explanation (from Flinders Petrie among others) that it was Fourth Dynasty because of the style of the tomb found at the bottom, and the 20th century theory dating it all much later, to the 26th Dynasty (600 BCE) because of the four sarcophagi found by Vyse, three in basalt and one in bluish schist now in the British Museum. One was of Wah-Ab-Ra, one of Ptahotep, an official of the Persian period, and two were of two important people both called Nesisut, from the town of Imet in the east of the delta and dated to the 30th Dynasty, a very late period in full decline. Note that it is not the structure of the shaft itself that was considered as dating evidence but the stonework found at the bottom. And there are a few other eye-catching details: for one thing, the stone-built tomb at the bottom was of unusual form, having an arch and three supporting stone pillars. (Sadly it is no longer to be seen as it was demolished by the government some time ago and reused in building a mill! Luckily we still have the drawings done by Vyse.) For another, it was not at all usual to place a tomb in a shaft so wide, thus the tomb seems to have been added later. Once again, we should avoid the mistake of basing the date of something on an object found inside it! So this seems to be yet another instance of an earlier construction being reused later as a tomb. Further proof can be seen on the walls of the shaft, where there are many traces of rows of stones that Vyse himself said could be the remains of a series of platforms, maybe added in the course of time to fill in this empty space. There are also lines of stones left at intervals across the width of the shaft, rather like the one seen in the strange trench on the east side of the Great Pyramid. This also has traces of very early erosion, as you can see from the photo. Nobody has yet worked out what this trench could have been used for. But one thing strikes the eye of those who know what they are looking at, the fact that this Campbell Tomb is undoubtedly much older than the Fourth Dynasty. Once again an analysis of the erosion of its sides by geologists (if they are allowed to carry it out) might well be very revealing, as there are the same signs of wear from running water as on the very worn walls of the Sphinx enclosure, as you can see. Sooner or later the specialists will have to compare the deep fissures in the shaft with those in the enclosure. It is not yet clear if the erosion is the same on all four sides of the shaft. While making our way back towards the Khentkhawes structure, we should pause to mention another very intriguing shaft, which is in danger of being cemented over to discourage the inquisitive. Several tombs nearby have recently been given the concrete treatment and one should fear the worst … This shaft is fascinating because it has all the marks of very great age. Its vertical grooves suggest that it could have been some kind of hydraulic lift! Colonel Guy Mouny and Guy Gruais had the idea in the 90s of pointing out the similarity between this shaft, with its grooves that continue right down to the bottom, and the lifts with descending platforms used to put submarines into the water. Without going as far as imagining submersibles, the shaft could have been full of water, with a platform that rose or fell with the water level. It has even been suggested that it could have worked as a lift, linked to an underground canal of varying levels that used a valve as a lock. By manipulating the valves it would be possible to raise or drop the water level and with it, a floating platform. You can see how exact the grooves are. You can even make out a sort of arrival platform at the top of the shaft. The same investigators have gone so far as to suggest that the Campbell Tomb with its overflow channel could be a decompression shaft, because during the flooding of the Nile the water pressure in the underground channels must have been very high. For those who find this hard to believe, don’t forget that pharaohs such as Amenemhat I (1991-1962 BCE) launched major hydraulic works at Fayum, including dams with locks, and restored a vast network of distribution channels. The Belgian Gerd Vandercruys pointed out in his study that the signs of erosion in the Campbell Tomb could have been made by water in the shaft moving to and fro against the stonework and thus eroding the walls. 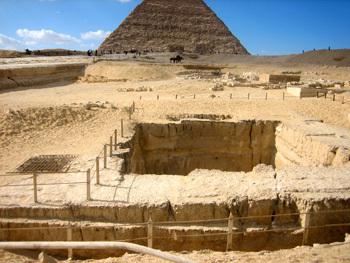 What is certain is that the significant fall of the ground between the second pyramid and the Sphinx, as well as the extraordinary number of shafts of all kinds, including many small ones, make one think that there must be an incredible underground network in this area, apart from the recognized tomb shafts of the necropolis. And there is every chance that in the future the area between the Khafre pyramid and the Sphinx will reveal a great many more secrets. Sir W. M. Flinders Petrie, The Pyramids and Temples of Gizeh, 1883. Colin Reader, ‘Giza before the Fourth Dynasty’, Journal of the Ancient Archaeology Forum, vol. 9, 2002. 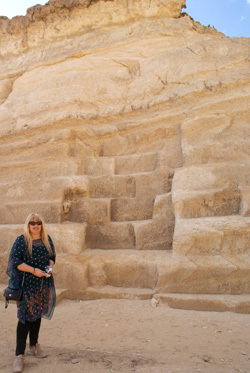 Colin Reader, ‘A Geomorphological Study of the Giza Necropolis with implications for the development of the site’, Archaeometry 43.1, 2001. Robert M. Schoch & Robert MacNally, Voices of the Rocks, 1999. Robert M. Schoch, ‘Geological Evidence Pertaining to the Age of the Great Sphinx’, 1999. Gerd Vandercruys, ‘The Sphinx: Dramatising Data … and Dating’, PalArch: Netherlands Scientific Journal, vol. 1, no. 1, 2006. Philip Coppens, ‘Pyramid Cavities’, The New Pyramid Age, O Books, 2008. Guy Gruais, Guy Morny, « Guizeh, au-delà des grands secrets », Editions du Rocher, 1992.